Say hello to this themed restaurant that has splendid decor and cosy ambience. Go here to gorge on an not-so-traditional Biryani that'll get you hooked. 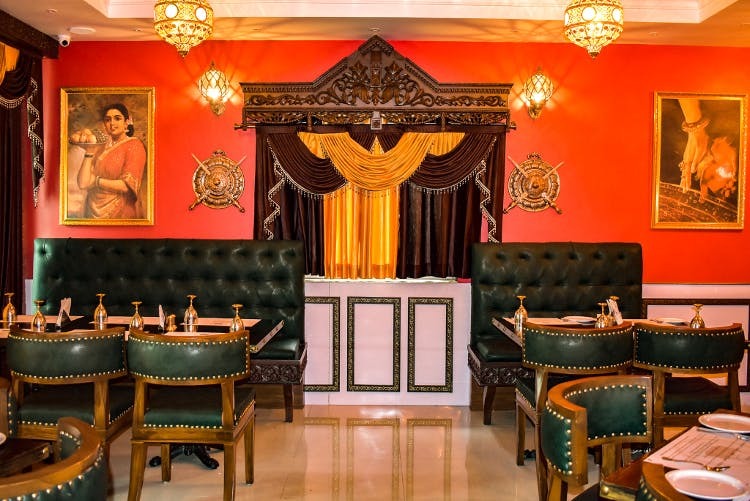 Bakasura is an ideal restaurant for squads and families alike, thanks to the unique decor. We loved the catchy music and the space that is done up with grand chandeliers and the bright walls. Further in, there are luxurious sofas and chairs and ironically, pictures of gods and goddesses on the walls. All the frames from the Telugu movie Mayabazaar are framed on a wall, adding to the ambience. They serve three different cuisines — South Indian, North Indian, and Chinese but their most popular dish is the Potlam Biryani which is served wrapped in an omelette. As bizarre as it sounds, it is definitely worth a try if you're looking for a twist in your regular Biryani. It comes with kheema pulav and little shrimps, and you couldn't help but drool. So, go here not expecting unlimited food that Bakasura is known to eat, but for a filling and decent meal. The time taken for service was a little too long, and could be faster. We could also use more vegetarian options.